Happiness atmosphere seen from collective and itsbat marriage participants since they can perform marriage ceremony which was facilitated by Jakarta Provincial Government.
" 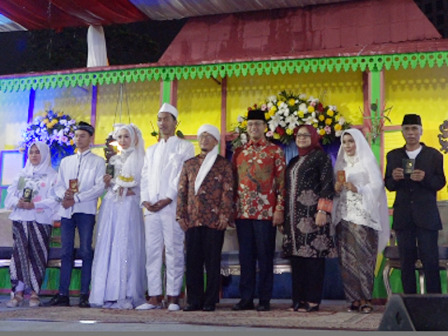 Thanks to Jakarta Government and Mr. Anies"
This ceremony was held in conjunction with New Year's Eve with total 574 couples who take a part in both collective and itsbat marriage ceremonies at Park and Ride Thamrin 10, Jalan MH Thamrin, Central Jakarta. Jimmy (19) and Rizka (19), the youngest couple in this event expressed their happiness since they are now officially husband and wife. Jimmy who is also Cikini Resident of Central Jakarta, expressed his gratitude to Jakarta Government for facilitating collective wedding which is free of charge. "My family and friends are here. I am so happy," he conveyed, Monday (12/31) night. Meanwhile, his wife, Rizka said, Jakarta Government has prepared various needs for marriage including dowry. "Alhamdulillah, our marriage can be witnessed directly by Jakarta Governor and family," she added. Another couple, Mardianto (76) and Watinah (65), Cempaka Baru residents, Central Jakarta, also expressed their happiness after performing itsbat marriage in this chance. Mardianto explained, he got information regarding collective and itsbat marriage from urban village side one month ago. "Thank God, our marriage is now officially legalized, registered and we can get it for free," he said. According to Watinah, his wife, this event really helps poor people. "Thanks to Jakarta Government and Mr. Anies. I feel very happy and helped," she conveyed.